As I’ve said many times, “You have to grow a plant to know a plant.” So when something shows up in my garden I’ve never seen before, I’m quite apt to let it grow and learn what I might from it, and then decide if it’s a permanent guest or someone who just paid a visit and I learned all I could while it was here. Thus my summer learning all about mullein, for example. Also, there was my discovery of borage, which continues to blossom on its own and I still treasure. The story of this year’s unexpected guest begins in my neighbor’s yard, across the street. The house, owned by a gardener, was sold last year to a young busy couple, rarely at home and lo and behold I one day, to my dismay, discovered a prickly plant growing upright in front of their house. 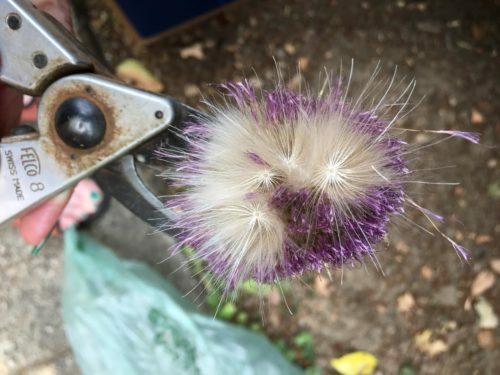 It had not come to blossom yet, but I was pretty darn sure it was a thistle. And I was, quite honestly, kind of piqued. Oh, yes. 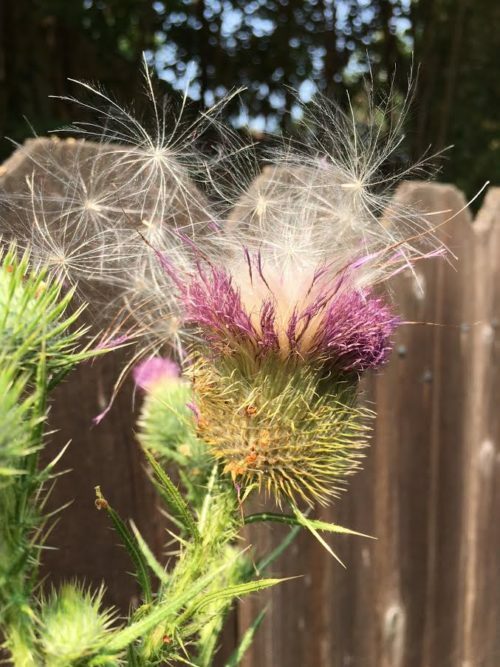 Had you read my mind you would have found over the weeks such unlofty thoughts as, “Don’t they realize this plant will go to seed and we will be pulling up thistles? ?” You get the picture. 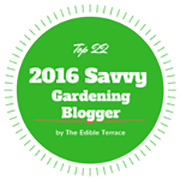 My gardening self was self righteously annoyed and let me know. Haha. Eventually the plant did blossom and confirmed my suspicions, and then one day it was simply gone. They cut it down. Good. 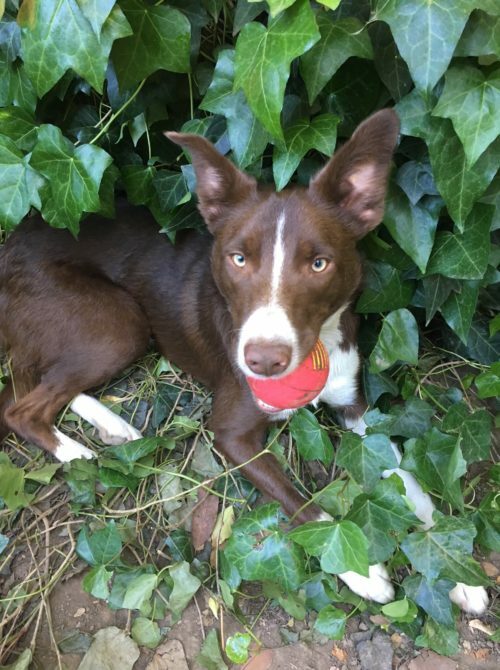 Meanwhile, and this will sound like a wide diversion, my elderly Border Collie was beginning to fail, and missed the one we lost last summer (I told myself) so I reached into my Border Collie history and was immediately told of two litters of puppies, and given two phone numbers. One didn’t answer and the second one did. One little boy, ready for a new home. The breeder shared his background. Scottish roots she said. She’d given him a temporary name, as breeders do, which I will not reveal here (the past is past), but I will say that I endeavored somewhat to find a name that would be akin. And then I discovered that the national flower of Scotland is a thistle. Voila! And so Thistle came to live with us and here he is. Adorable, right? Love, love, love him. And then a funny thing happened. Very near where I discovered my first mullein, along the fence, emerged a prickly plant low to the ground, which a gardener ID’d for me as common thistle. Oh course now the reframe fell in place. The one in my neighbor’s yard had been a harbinger of what was to come. (It could happen.) And so I decided immediately to let it grow and honor it as a tribute to my new love and see what it was about. Since I watered it continually (it grew among hollyhocks) it thrived! And I loved it. So pretty. And the bees love it. And then one day I looked out the window and this had happened! I continue to indulge in the beauty of those purple flowers. It is really hard for me to dispose of anything the bees like, bless them. But I will be watching carefully for any more explosions. And this will be my single adventure into growing this plant, which I have enjoyed immensely. 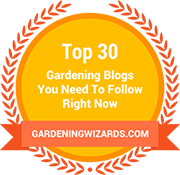 What plants have shown up in your garden you allowed to grow that you learned from? Book Notes: Good news. 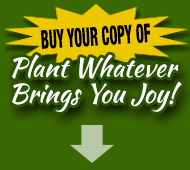 Awareness Magazine will be excerpting a story from Plant Whatever Brings You Joy in an upcoming issue. 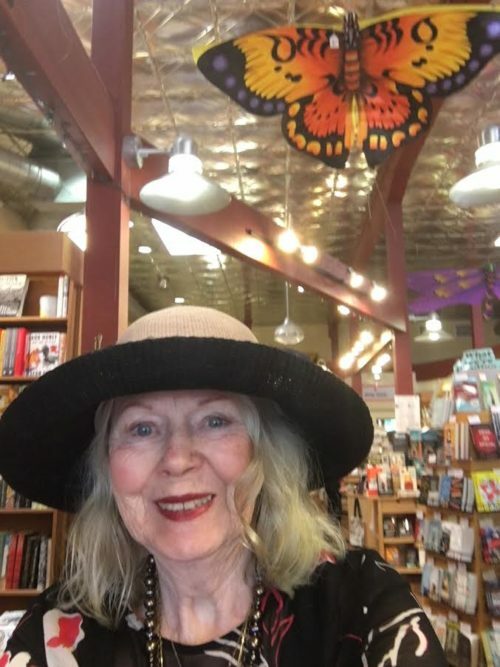 And I have begun doing author Meet and Greets again and was hosted by Copperfield’s Books in Healdsburg recently which was a joy, and for which I am grateful. 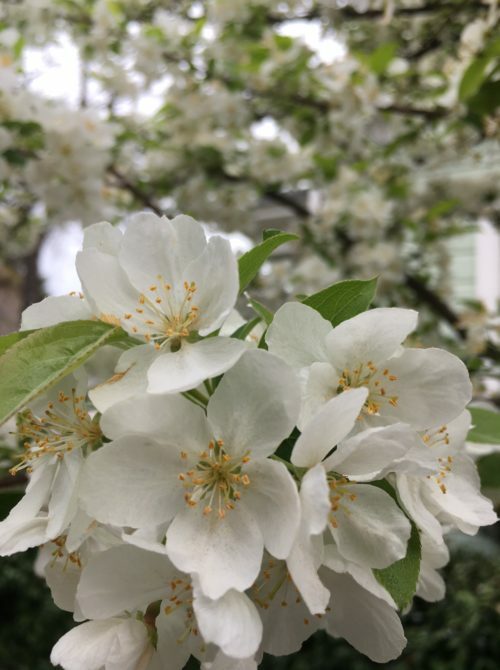 Synchronistically, Arbor Day arrived yesterday and I experienced a moment of glee when I learned, as I have been going about town for the last few weeks, at various times of the day, combing neighborhoods, to capture images of the beauty of trees in spring which are such a blessing. 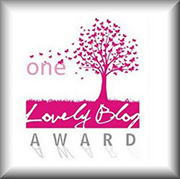 Today I’m unveiling some of my recent discoveries. 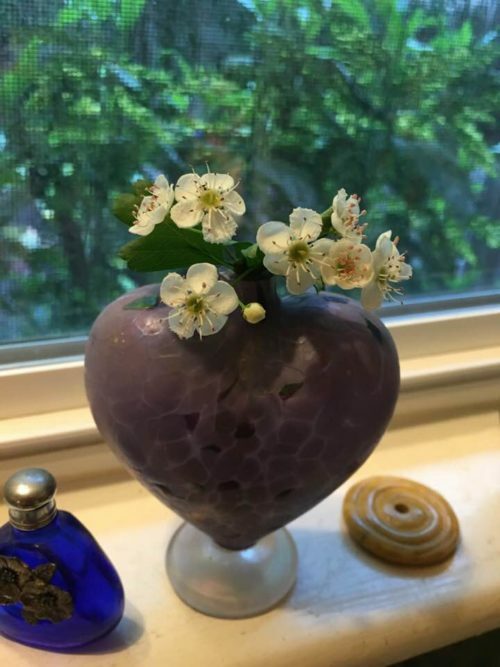 Most bear flowers, as that was my intention, but ultimately I included a couple not in that category, but that captured my heart and imagination. 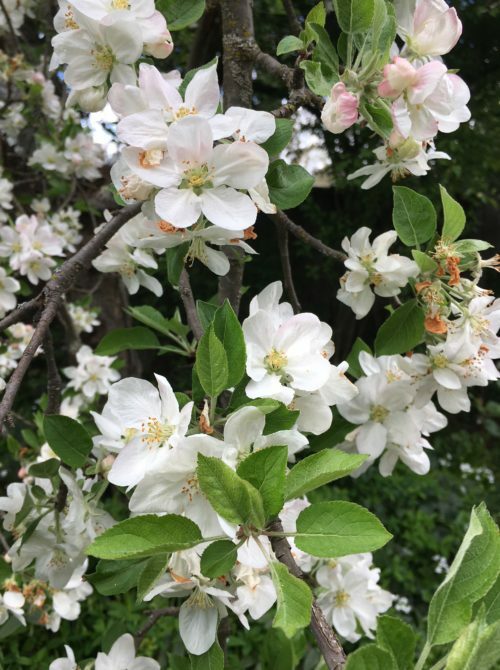 The one of the apple tree above grows in my back garden, among other fruit trees, including a fig, a plum and a walnut tree, for which I am all most grateful. 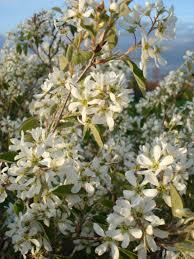 When the few blossoms began to emerge I brought one in to enjoy. There are several trees I photographed I’m not familiar with. Whoever ID’s the ones I myself don’t know will be sent a copy of Plant Whatever Brings You Joy! 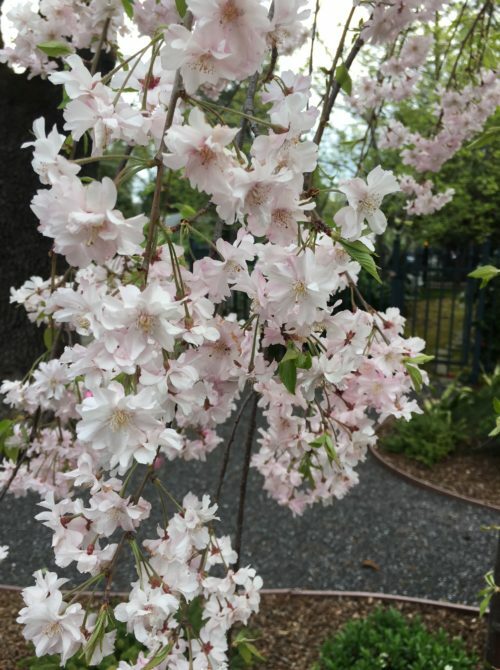 Here is one such tree.The delicate pink and white flowers are spread along hanging or weeping branches. 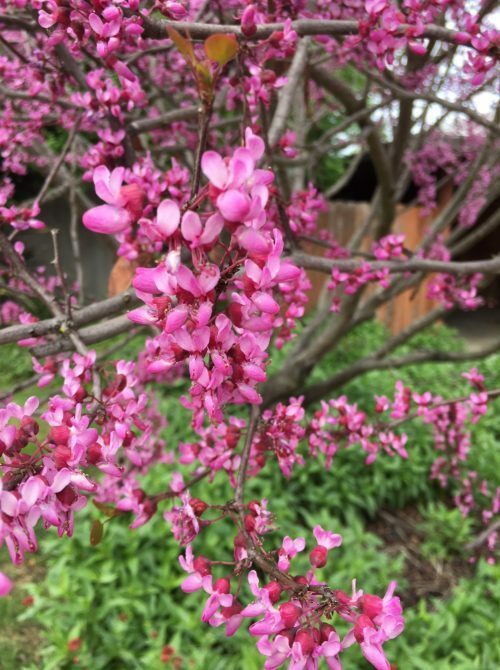 These much loved redbuds have been gracing our town for a few weeks. Another–a closer view. This one was full of bumblebees who seemed, not alarmed, but protective of their find. I didn’t feel threatened but they were aggressive about letting me know it was their redbud tree! Haha. I am told, and I tend to believe, that this is the only tree of its kind in this town. Many folks have taken note of its whereabouts and look forward to seeing it each spring. 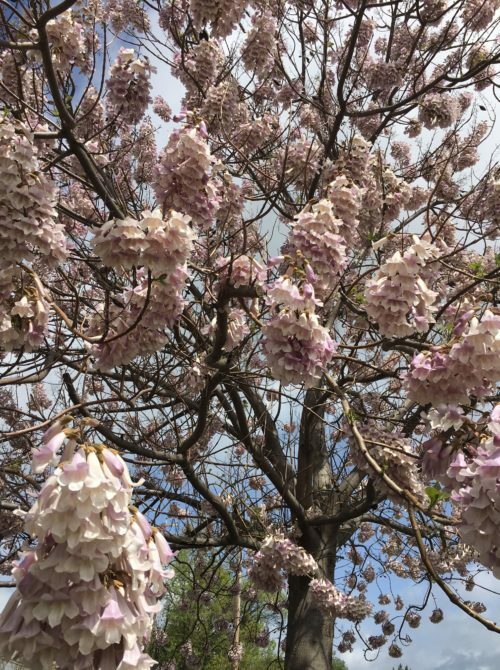 I only know its name, paulownia, because I included it on a post years ago, which led to a proper ID. This is one of the flowerless trees that I really love. 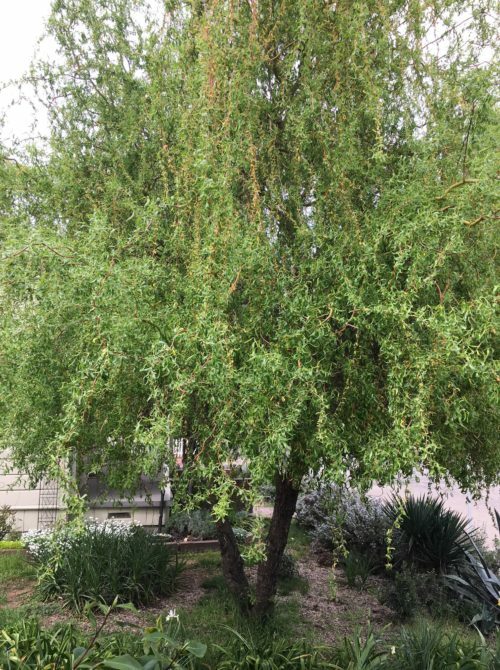 It’s called curly willow or corkscrew willow. I prefer the former, don’t you? 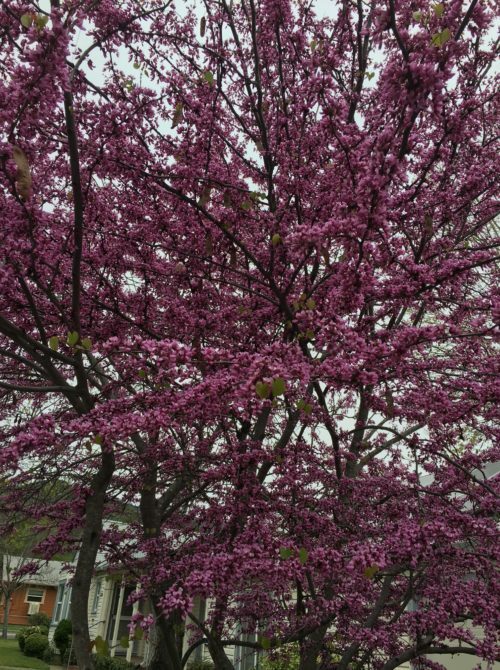 Concurrent with the abundance of redbuds are the dogwoods. 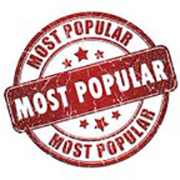 I’m including three in this post. Here’s the pink, with which you might be more familiar. 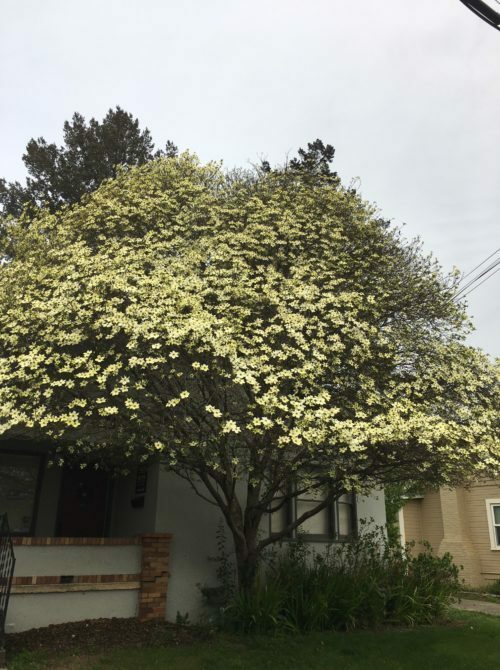 And, lastly, I include Pacific dogwood. 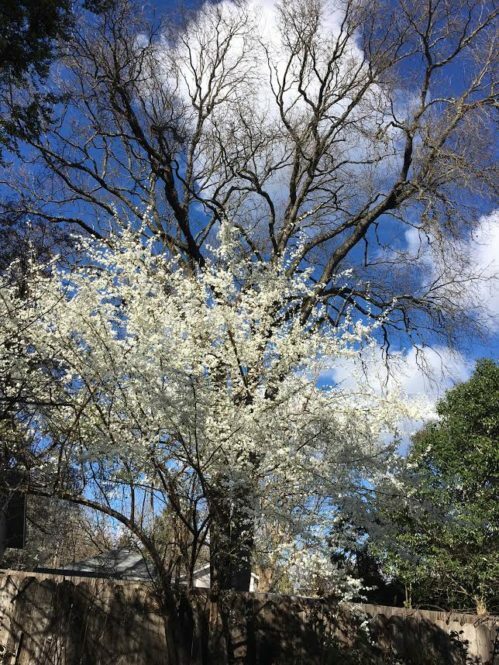 There is a story in this neighborhood that the man who used to own the house down the street, where this tree resides, had purchased a few acres “for firewood” up north of here. And apparently on that property was this Pacific dogwood. He dug it up and placed it in his garden in town. But no one knew its name. 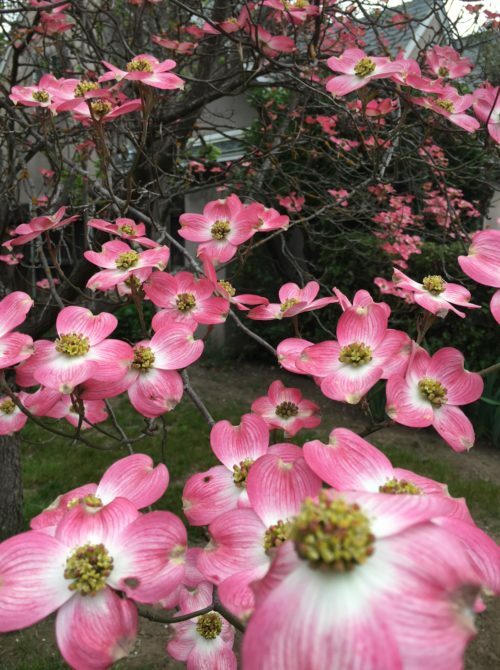 It was simply called “a wild dogwood”. 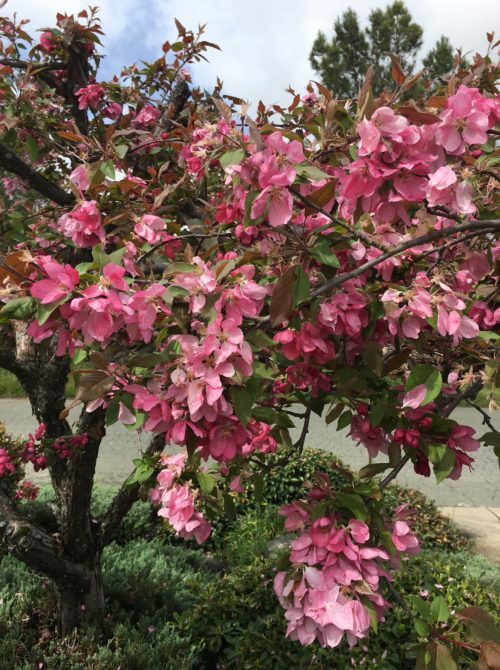 (As fate would have it) horticulturist Roger Raiche happened to post a picture of a branch of this tree he located in Sonoma County, properly labeled as Pacific dogwood, so I sent him the pic below and he responded that he’d never seen one with so many flowers, and he suspected this one thrived because it had no competition to expand. As a lover, student and author of gardening metaphors, you can imagine I loved hearing this from him. 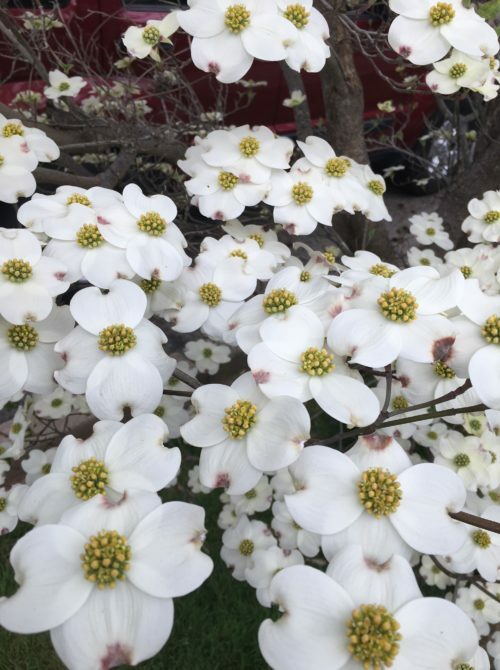 Note that Pacific dogwood flowers have five petals, not four, and they emerge rather green and turn white within weeks. Whoever can ID the three I’ve left unnamed wins a copy of my book! Just leave a comment below. I know East Coasters especially are still awaiting the glories of spring. I do hope you are finding the annual joy of watching our gardens come into promising bud, and emerging with their full beauty. Those of us who honor this tradition and practice are so so lucky! What is your favorite thing you look forward to each spring in your garden? 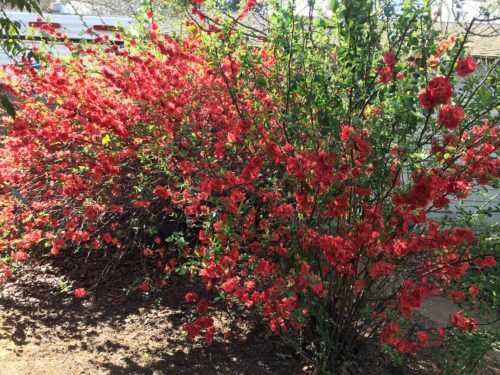 Footnote: Here’s a pic of a shad bush in flower, which Alice mentions on comments below. She’s in New York state. 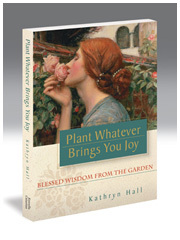 Book Notes: Reminder that Plant Whatever Brings You Joy: Blessed Wisdom from the Garden makes a lovely gift for the loved Mothers in your life. Thank you for ordering a copy on Amazon, or Kobo or Barnes and Noble! 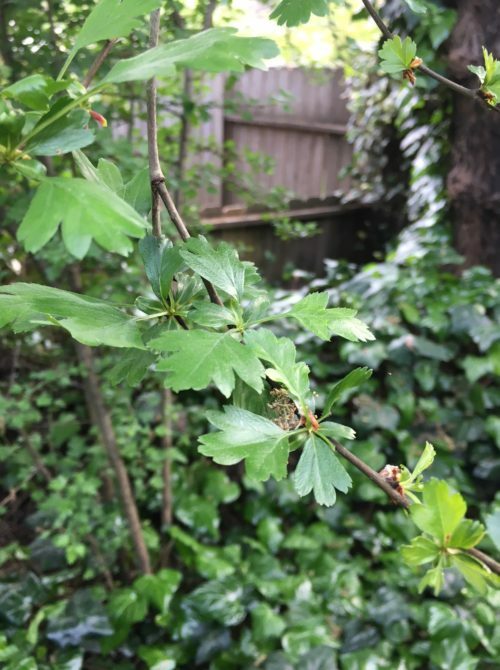 As I tune in to gardening bloggers’ reports of their garden activities and local weather around the country there is a common thread–most of us are getting an early version of spring, followed by a colder, wetter winter pattern. So January and February sported some unusually warmer temps now followed by some pretty colder nights and days! Ah, but those warm days were appreciated in all honesty, and for a few weeks the garden flourished, and some hardy souls still prevail! Blossoms in the plum tree were more abundant than I ever recall before, backed by the bluest sky to grace this valley in a long long time. 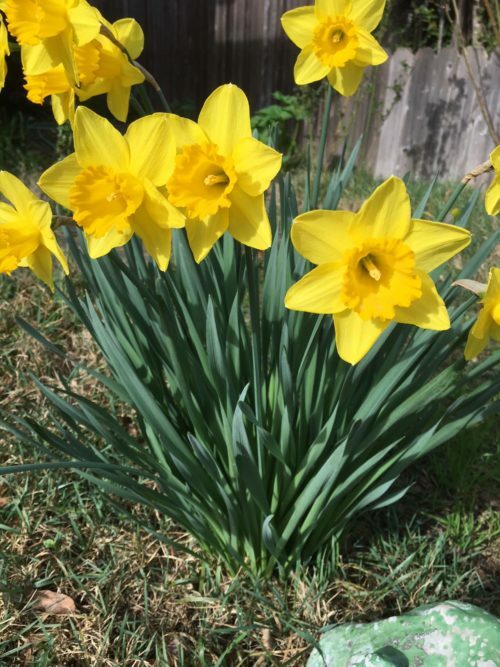 Consistent with the generous bounty the daffodils made a splendid showing! 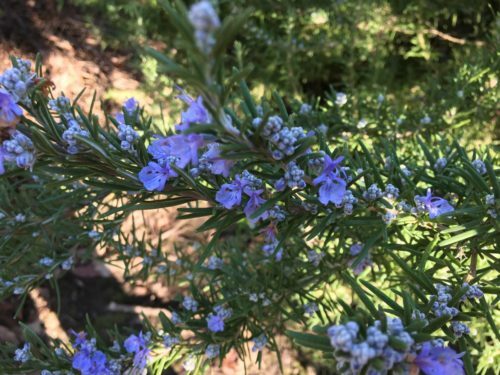 Not to be outdone, the rosemary sported the most blue blossoms since being planted a decade ago! 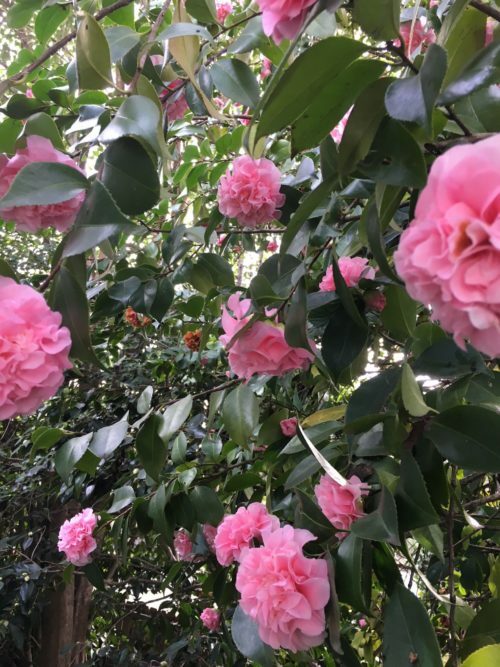 Responding to the unusual warmth and gentle rains, the camellias began their annual parade. I never tire of their beauty, as one might imagine. 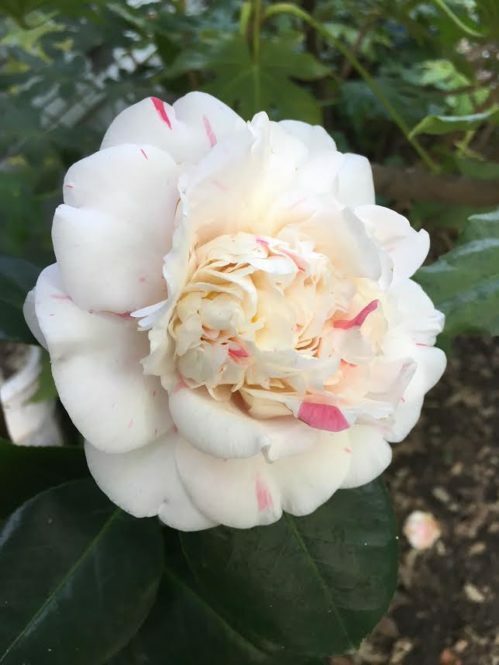 These large white with pink camellias are a double joy as they smell like gardenias! 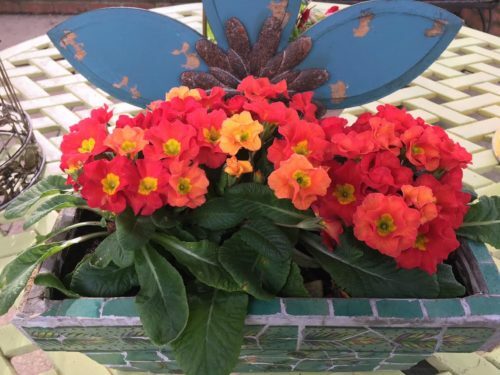 Inspired, I pulled out winter pots, cleaned them up and began filling them with flowers I know could withstand any turn in the weather. 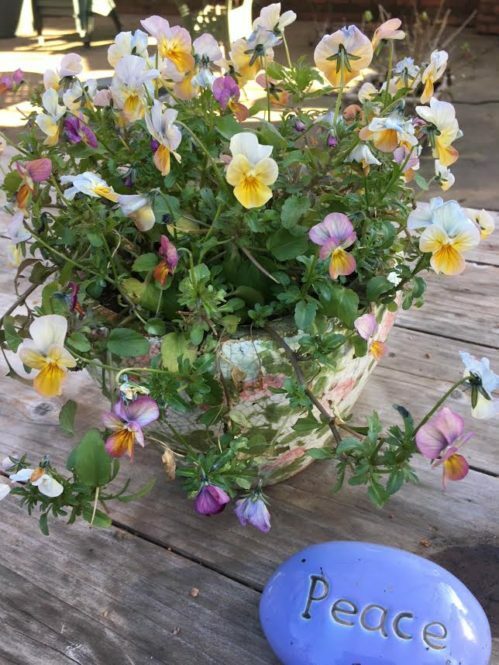 I learned when I lived in Asheville through two cold winters that I could rely on pansies and violas. Good to know! 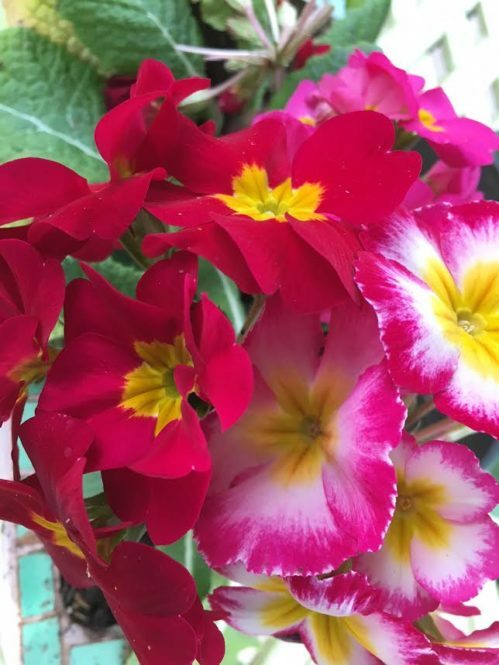 And primroses will also do well in the changing of the seasons, particularly if left in pots on tables protected by an umbrella or overhang or perhaps a shrub overhead. Yesterday I saw the my first butterfly of the season and this afternoon I spied two bumblebees in the blue blossoms of the rosemary. 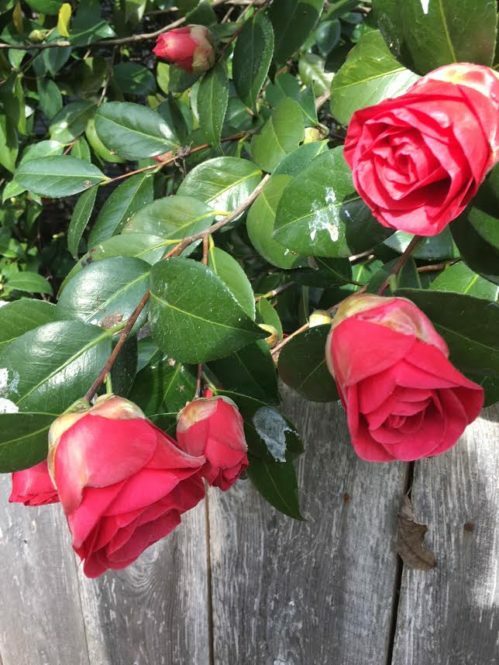 If indeed there are more cold nights spring has taken a firm hold in Northern California and I celebrate and embrace its beauty with love and great joy. What is blossoming early in your garden?